The Forest of Bowland has attracted a multitude of high quality artists and craftspeople that live and work within the AONB - why not browse our arts and crafts online directory to look at the whole range of arts & crafts producers and galleries and studios. Whilst you will find many Bowland artists and craftspeople working in a traditional manner, don’t be surprised to come across some contemporary and innovative work – abstract oil paintings, temporary environmental works, installations, brilliant community and celebratory art which responds to and celebrates the sense of place of the Forest of Bowland. The northern part of Bowland hosts pioneering rural arts organisations such as Green Close Studios in Melling, Pioneer Projects in Bentham & Maiden Bridge Arts Centre in Tatham. The Lunesdale Studio Trail holds an annual Open Studio event in the spring, (usually during May & June) and across towards the southern part of Bowland New Form Arts artists’ group are growing in membership and vision. The unique high quality crafts which the Platform Gallery in Clitheroe has on exhibition and for sale, is an excellent opportunity to see quality contemporary craft. Further south artists and craftspeople based at Higherford Mill in Barrowford are amongst many enjoying the beauty of Pendle Hill. 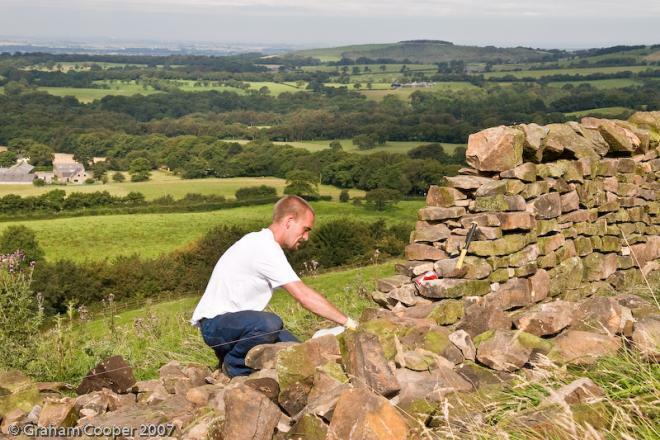 The special qualities of the Area of Outstanding Natural Beauty's landscape depend on farmers, skilled craftsmen and contractors - why not browse our rural skills online directory to look at the whole range of skills on offer. Traditional boundaries, in particular laid hedges and dry stone walls, make an immediate visual impression on people that distinguishers this part of the country from most others. Walling and hedging are skills that take time and patience to acquire. Contractors specialising in these skills are in demand from landowners as are tree surgeons, fencers, mole catchers, shearers and the like. In villages within the AONB, and some of the finest are designated as conservation areas, there is demand for traditional building crafts and for craftsmen who can sensitively repair features that cannot be replaced using local materials and traditional techniques. There are so many particular features that give a village and the houses and businesses within it, it's own sense of place – doors, chimneys, windows, roofs and the like. Whenever a change is made to a property in the countryside or in a village or to the landscape, we would recommend that consideration be given to maintaining consistency with local style. Local contractors are well placed to advise and carry out such work. For further information on what constitutes local style then see pages on 'Bowland's Built Environment'.